Kavanaugh came down squarely on the side of Priests for Life in rejecting the Obama administration's claim that there should be no religious exemption from its Health and Human Services mandate. He said that this mandate, which ordered Catholic non-profit organizations to provide for abortion-inducing drugs, contraceptives, and sterilization in their healthcare plans, was in violation of the Religious Freedom Restoration Act. Kavanaugh turned back a challenge to the constitutionality of Inaugural prayers brought by atheist activist Michael Newdow. He did not mince words, saying that the religious significance of this well-established prayer cannot be discounted, and in no way runs afoul of the First Amendment provision regarding separation of church and state. 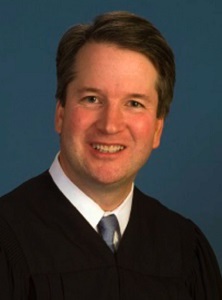 Kavanaugh made a strong case for religious liberty by challenging the right of the Washington Metropolitan Area Transit Authority to censor a Christmas bus ad sponsored by the Archdiocese of Washington. The agency banned the ad because it "depicts a religious scene and thus seeks to promote religion." The scene, which shows a silhouette of shepherds and sheep on a starry night, is inscribed with the words, "Find the Perfect Gift." The ban was criticized by Kavanaugh who called it "pure discrimination." Kavanaugh offered a stinging dissent in a case brought by the ACLU that sued the federal government for not facilitating an immediate abortion for an illegal minor. He accused the majority of overreaching, of assuming supra-constitutional authority. He also noted that the government had "permissible interests" in "favoring fetal life," thus sending a clear message to those who deny that there is life in the womb.